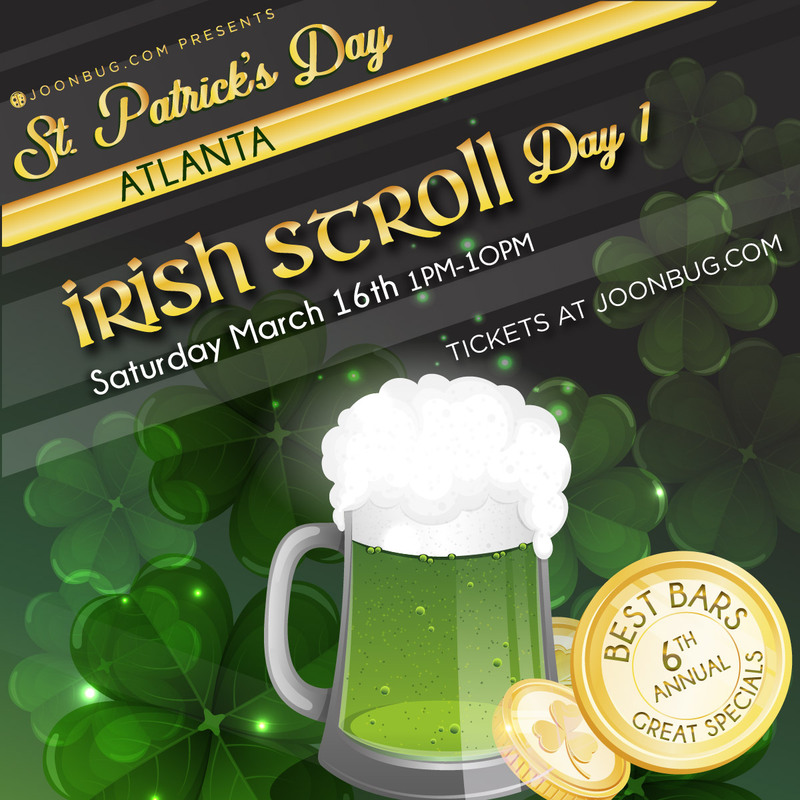 Our famous St. Patty’s Irish Stroll bar crawl is back, Atlanta - and it’s bigger and better than ever. Day One takes place the day before St. Patrick’s Day, but that’s not stopping us from making this bar hopping adventure an all-out green explosion. Atlanta’s best bars and pubs are opening their doors and letting you in with no admission fee. All you have to do is don your wristband and you’ll get access to St. Patrick’s Day drink specials at every stop off this lucky train. Go along for the ride and prepare to stop, drop, and drink on the St. Patrick’s Day Irish Stroll! From 1pm to 8pm you and your friends will head to the registration site to pick up a wristband and a map to get started. Going with more than three people? We’ve got you covered with a group discount for groups over four and multi-day passes are available for the thirstiest of crawlers who want to experience a whole weekend of St. Patrick’s Day Events! Special Instructions E-Tickets: A confirmation of your bar crawl order will me emailed to you with a link to your E-Ticket for registration at your selected Registration Site. Scanning E-Tickets: Your E-Tickets will be scanned at the Bar Crawl at your registration site. Bring a printed copy of your E-ticket or have it displayed on your mobile device. Photo ID: To gain entry to the Bar Crawl you must present a valid government photo ID. Note: The Bar Crawl is a 21+ event. No one under 21 will be admitted to the events. Registration: Come to the Registration site you selected in order to receive your wristbands and maps. Registration Time: It is important to register during the crawl's established registration times. If you arrive after registration closes you will not be able to get your wristband and map. Crawl Route: There is no specified crawl route; it is completely up to you to choose where you’d like to crawl! Use your BarCrawls.com map to determine your route and bar hop at your leisure. Capacity Restrictions: If it happens that a bar is full, no worries, keep crawlin' - there are plenty of bars to choose from on the map. You can bar hop back later in the crawl. Please note participation times of each bar! Additional Tickets: If you would like to purchase additional tickets you may do so the day of the event. However, tickets prices online and at the door are higher on the day of the crawl. We encourage you to buy in advance.